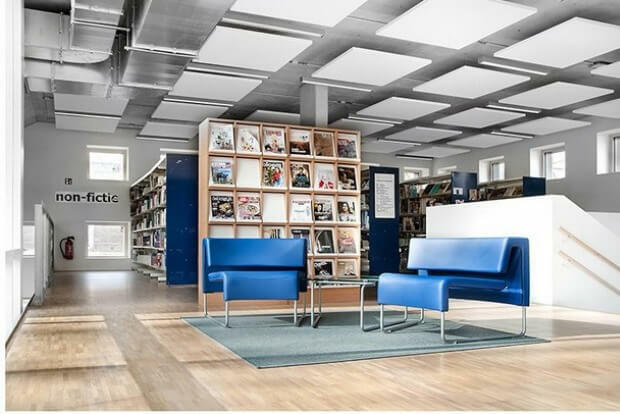 Carefully chosen library display furniture maximizes storage space, improves user experience, and lends aesthetic appeal to the library’s interior. Freestanding display shelves come in several different colors and sizes, and enable users to quickly find and pick displayed books. Freestanding units can be one-sided, or they can be double-sided, giving readers access from either side. 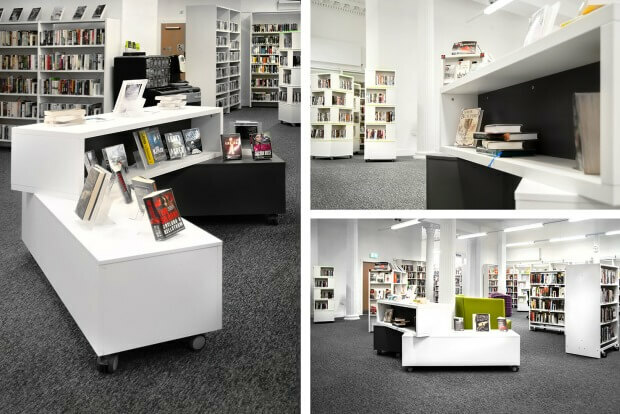 Book carousels are ideal for libraries with space considerations, as they are able to store large amounts of material in a relatively small space. Display boards typically have adjustable shelving, and are designed to be placed or mounted against a wall. Display “ladders” are similar in intent to display boards, but are leaned against the wall, or against another “ladder” to create a sandwich board effect. Most boards and ladders have adjustable shelving, so they can hold media of all sizes. Freestanding display shelves on wheels are also a popular choice for many libraries because they allow librarians to easily move displays and create new spaces. Display towers are tall, four-sided units that display books and paperbacks, magazines, and other media. Display towers can be fixed or on wheels. There are also display towers with components that are configured to combine display and storage in one pleasing package. For those who are looking to safely display artwork, collections, and other materials, display cases, available in many different materials, styles, and models, are designed to protect and store these items behind glass. When it comes to storing media such as CDs and DVDs, there are many user-friendly, freestanding cabinets and browsers. These typically come with dividers and inserts, so they can be custom configured.